I couldn’t help but notice Dubai as the land of the largest. Aside from being the largest city in the United Arab Emirates, Dubai is home to Burj Khalifa (the tallest tower in the world), the second-biggest mall (depending on how you measure), and a series of massive artificial islands in the shape of palm fronds and continents along the country’s coastline. Following this trend, it was fitting for the city to host a major consultative workshop on probably the largest cross-disciplinary subject area: land cover and land use change. Mapping and monitoring landcover (forests, rangelands, cropland, & settlements) helps us understand change over time and is critical to maintaining healthy ecosystems that can provide carbon sinks for limiting greenhouse emissions, arable land for food security, and habitat for wildlife. Additionally, land cover dictates how water flows across the land surface and has a direct impact on water quality and water resources. The two-day workshop focused on the Afghanistan National Land Cover Monitoring System (A-NLCMS), a customized service for annual land cover mapping and change analysis. Using remote sensing inputs from Landsat and Sentinel-2 satellites, a standard methodology, and consistent datasets, A-NLCMS is able to address gaps in regional land cover data. The service is a collaborative effort, co-developed by two regional instances of SERVIR: the Hindu Kush-Himalaya and Mekong, with additional support from the United States Forest Services (USFS) and SilvaCarbon. The workshop brought together a high-level delegation from Kabul, including Director Generals from the Ministry of Agriculture Irrigation and Livestock, Afghanistan Meteorological Department, National Environmental Protection Agency (EPA), Deputy Director Generals from the Ministry of Energy and Water and the National Statistics and Information Authority, to name a few. Workshop deliberations were fruitful and succinct, achieving the main objectives of finalizing the methodology and approach of the A-NLCMS, while defining the roles and responsibilities of both SERVIR and relevant Afghan ministries going forward. This consultative process is vital to understand needs and current capacities, and allows for the design of innovative (and regionally appropriate) scientific solutions. All in all, the workshop was exemplary of how SERVIR works: bringing together people from diverse backgrounds to address complex environmental issues around the globe and co-develop solutions with local decision makers and stakeholders. Though the trip was short, the camaraderie the workshop facilitated resulted in great memories and experiences. We enjoyed a night on the town where we stumbled upon the world’s largest (of course) choreographed fountain system: the 30-acre Dubai Fountain. 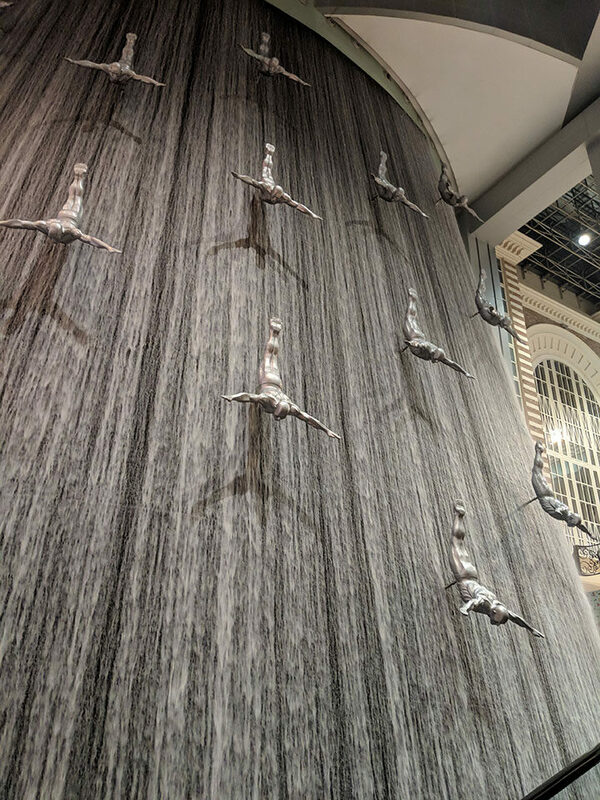 Pictured above are the Freedom Divers, part of an indoor water feature cascading down all three stories of the Dubai Mall. It’s a true pleasure to be a part of a project that brings people together across so many cultures, agnostic of borders, to address pressing issues. The experience reminded me a of a lesser-known world record held by the country: in December 2014, to celebrate the 43rd National Day of the UAE, people of 117 different nationalities came together to sing the UAE’s national anthem, creating a world record for the most nationalities to come together and sing a national anthem at one time. 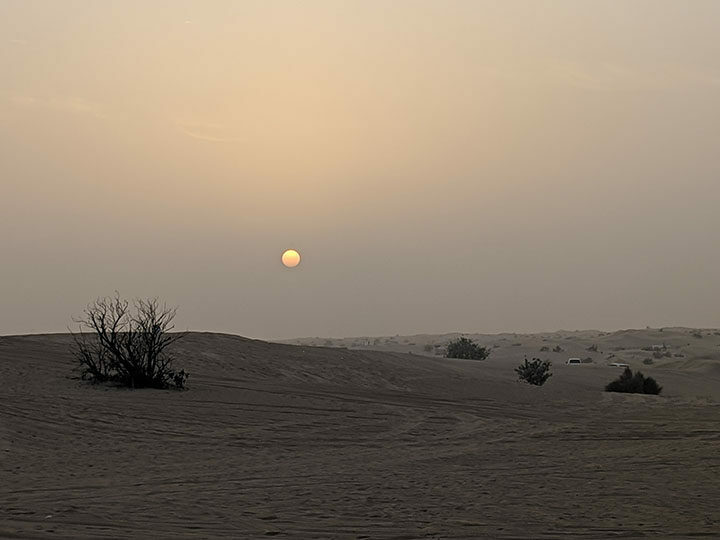 A desert sunset to cap off a fun and successful trip. This entry was posted on Thursday, March 7th, 2019 at 4:25 pm and is filed under Connecting Space to Village. You can follow any responses to this entry through the RSS 2.0 feed. You can skip to the end and leave a response. Pinging is currently not allowed.